I used model magic to get a handprint and then painted the print instead of attempting to paint each hand and get a quality print. It was much easier for the patients and the families seemed to love them. Painting the hand of an intubated child may be easier at times; however, it can be extremely over stimulating and it is essential to watch the monitors and the child's cues to assess how each patient is tolerating the stimuli. As far as legacy building goes, I am torn. If this was the only thing I could get with a sensitive, intubated patient it would work, but the paint takes away the lines and finger prints that make each mold unique. 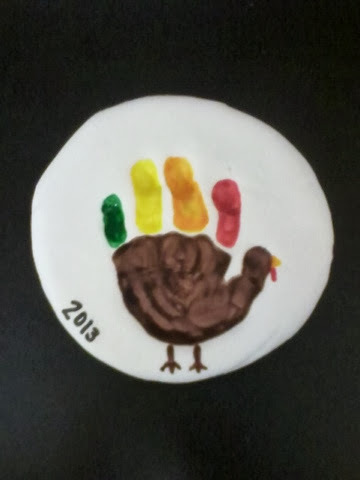 Many of the turkeys I painted myself, but, when appropriate, I gave the supplies to the parents or siblings to participate which seemed to be well received. Overall, I would say this activity was successful and will be utilized again. What activities do you do with your patients or children for the holidays?